This is a one-locus, two-allele genetic simulation program for use by students. It simulates multiple populations and allows you to see the effect of natural selection, mutation, migration, and genetic drift. It is freely downloadable. It is written in Java, and will run on Windows, Mac OS X, and Linux systems if they have Java installed on them. At its web site evolution.gs.washington.edu/popgen/ is a downloadable "zip archive" which contains a Java archive file which has the Java executable as well as the Java source code. It also has this web page. There is also a folder images for the screenshot images used in this web page. The compiled Java code in the Java archive file can be run on any system that has a reasonably recent version of Java installed. The Java source for popg is called PopGUserInterface.java and is in the folder src. It was developed in the Eclipse development environment but any environment you are comfortable with will do. Normally you will not need the source code and you will not need to recompile the program. The source code is there so you can see how things were done and use it as a base to make changes to the program and extensions of the program, should you wish to do so. You can fetch PopG using the links below. Install it using the instructions below. Make sure you have a version of Java on your computer. Here are instructions for saving, unpacking, and installing PopG from different browsers, and on operating systems. We cover the Chrome, Firefox, Safari, and Internet Explorer browsers on the Windows, Mac OS X, and Linux operating systems. A downwards-pointing animated arrow in the lower-left portion of the browser window will move, pointing to a tab there called PopG.zip. PopG.zip will now be found in your Downloads folder. Click (or if this does not work, double-click) on the PopG.zip file. The Zip archive will be extracted into the Downloads folder. A folder PopG will be created in the Downloads folder. Move that folder to where you want it to be. A dialog box opens and offers to let you Save File. Choose that. The Zip archive PopG.zip will be in your Downloads folder. Double-click on it. The archive will be extracted and a folder PopG created in the Downloads folder. The Zip file PopG.zip will be downloaded into the downloads folder and will be automatically extracted. A folder PopG will be created in the Downloads folder. Move it where you want it to be. The Zip file will be downloaded into the downloads folder and will be automatically extracted. A folder PopG will be created in the Downloads folder. A MAC PROBLEM: On Mac OS X systems, when you attempt to extract the Zip archive, or when you attempt to run the Java executable, the system may complain that this is from an unknown developer. That is simply because I did not sign the file with my Apple Developer ID. You should be able to make the operation work by control-clicking on the icon and selecting the option to open the file, using the defaults suggested. Once it successfully gets past this, it will not bother you with this again. The PopG folder also includes the present documentation web page which you are now reading. This can be read here or you can use the Save As menu item in the File menu of your browser to save a copy of it on your machine. The latest version of this page can be read on the Web using this link. There are also older executable versions compiled for Windows, Mac OS X, and Linux systems, plus some even older operating systems. These can be fetched from folder old at our PopG site. Most users should not use these older executables, but if you do, you should start by reading the README file in that folder. One of the versions there is version 3.4, which has compiled executables for the three major operating systems available as well as C source code. These may be useful if you do not have Java and cannot install it on your system. We would like to make versions available for tablets and even phones. Unfortunately, a version of Java that can use the graphics functions does not seem to exist on the Android operating system and the iOS operating system. We would have to rewrite the program separately for each of those. If you know of a way to run our Java executables on either of those operating systems, and get it to work, please let us know how you did that. If you have Java installed you can run the PopG program. Generally, Java will be already installed on Mac OS X systems and on Linux systems. If you aren't sure if you have Java installed, you can type java -version in a command window and, it Java exists, it will tell you what the version is. If you get back a blank line, you need to either download Java or append where it is to your search path. On Windows systems and on Mac OS X or Linux systems that do not have Java, you can install a recent version of Java at no cost by using this link: java.com. Recent Linux and Mac OS X systems usually have a recent-enough version of Java already installed. Mac OS X systems 10.4 (Leopard) and earlier may not have a recent-enough Java to be able to run PopG. Windows systems do not come with Java already installed, but it can be installed on them from the above web site. There are two menus, File and Run, that control PopG. They are in the upper left of the main PopG window. The Run menu contains five items: Continue w/, Continue, New Run, Restart, and Display Whole Plot. with all but New Run grayed out. Once you have done your first run, all the selections will be active. It contains all the parameters that control a PopG run. Note that usually you do not enter a Random Number seed unless you want to do two identical runs. When you are finished editing you can click the OK box to start the run. You can also click Cancel to not start the run and Defaults to reset all the data entry boxes to their default values. This choice continues the run, for the same number of generations as previously entered in the New Run menu. which allows you to change the number of generations run in the next continuation of the run. This restarts the run with the same parameter values as before. If you want to change some of the parameter values, use New Run instead. This plots all generations on the same plot. During a run the plots will normally show only the last group of generations. This shows all generations that have been simulated so far. This is particularly handy when you have finished a simulation and want to print the results of the whole run. The program uses a random number generator which automatically initializes from your system clock. Thus it should give you a different sequence of random numbers and thus a different result every time you run the program. In the menu for a new run, there is a setting for Random number seed which is set by default to (Autogenerate), which will initialize from the system clock. You probably won't have any reason to change this, unless you are debugging PopG and want to do the same run, with the same random outcomes, twice. If you do wish to do the same exact run twice, enter a value in place of the (Autogenerate) string and PopG will use that to initialize the random number generator. Assuming you have not modified the calcPopG routine within the Java code, every time you start with that random number you will get exactly the same results. This contains four menu items. They are Save, Print, About and Quit. with Save and Print grayed out. Once you have done your first run, they will be active. This opens a standard save file dialog and allows you to save the graph as a JPG or PNG file. The default name is PopG with the appropriate extension to match to file format. This opens a standard print dialog and allows you to select a printer and print the graph. Displays the program's copyright notice. This is self-explanatory: the program quits. Most people will not need to compile the program themselves as the Java Jar package supplied should run on most versions of Java. So you should probably skip this section. But if you wish to modify the functionality of PopG or if you have some unusual Java environment that will not run the supplied Jar file you will need a Java compiler. We repeat: If you just need to run the program, you should run the Jar file that comes in our distribution. You do not need to compile anything (though you may need to install Java). If you cannot do, tell us, since that would be a bug. This program simulates the evolution of random-mating populations with two alleles, arbitrary fitnesses of the three genotypes, an arbitrary mutation rate, an arbitrary rate of migration between the replicate populations, and finite population size. The programs simulate simultaneously evolving populations with you specifying the population size, the fitnesses of the three genotypes, the mutation rates in both directions (from A to a and from a to A), and the initial gene frequency. They also ask for a migration rate among all the populations, which will make their gene frequencies more similar to each other. Much of the time (but not always!) you will want to set this migration rate to zero. In most respects the program is self-explanatory. Initially there are ten populations. 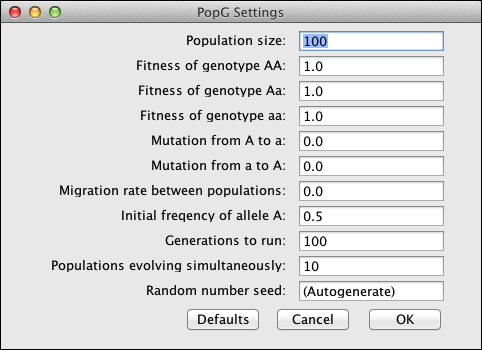 You can set the number of simultaneously-evolving populations to any number from 0 to 1000. The population size for each population can be any number from 1 to 10000. Note that a larger population, a larger number of generations run, and a larger number of populations can lead to longer runs. When you make a menu selection that causes the program to run, a graph of the gene frequencies of the A allele in each of the populations will be drawn in the window. Here is what the graph looks like when we run with an initial gene frequency of 0.2 and fitnesses of AA, Aa, and aa set to 1.08, 1.04, and 1, with all other parameters in their default values. (Note that if you try this run, there will be different random numbers, so your result will be a bit different). Note that the window can be resized, and the graph should adjust to this. There is also a blue curve that shows what the gene frequencies would be in an infinite population (one with no genetic drift). If the number of populations being simulated is set to zero, this curve is all you will see. The graph can be printed using the Print option of the File menu, or saved to a Postscript file using the Save option in that menu. 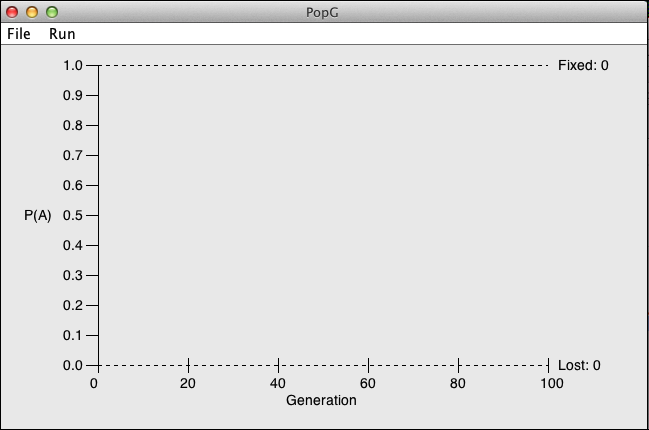 Note that once the plot of the gene frequency curves reaches the right-hand side of the graph, the program prints there the number of populations that fixed for the A allele (ended up with a frequency of 1.0) and the number that lost this allele. Try cases with no mutation, no migration, and all fitnesses 1.0 so that there is no selection. Does genetic drift in a population of size 1000 accomplish roughly the same changes in 1000 generations as genetic drift in a population of size 100 does in 100 generations? By running a largish number of populations, can you check whether the probability that an allele is fixed by genetic drift is equal to its initial frequency in the populations? Try a case with no mutation or migration, with the A allele favored by natural selection (with fitness of the AA genotype set highest and fitness of the aa genotype set lowest). Start with a small frequency of A. Is it always fixed? If one starts with a single copy of the allele, how does the probability that A is fixed compare with the selection coefficient favoring it in the heterozygote (the fraction by which the Aa genotype is higher compared to the fitness of the aa genotype)? Is this fixation probability larger than the one you would get with the same initial frequency but with no selection? Try overdominance (Aa having the highest fitness). Does the gene frequency converge towards an equilibrium? Why does it vary from this equilibrium frequency? How large do the selection coefficients have to be to cause the gene frequency to stay away from fixation or loss for large amounts of time? Try underdominance (Aa having the lowest fitness). Is there a starting gene frequency that will result in some populations heading for fixation, and others heading for loss? If you add a small amount of migration, what will happen in the long run? What will happen if instead you add a small amount of mutation in both directions? With migration but no selection or mutation, how much migration is needed to make the gene frequency curves be quite similar to each other? How much is needed to make them all end up at the same gene frequency in the long run? How is that migration rate affected by the population size? With mutation but no migration or selection, how much mutation is needed to cause the gene frequencies to converge to a mutational equilibrium gene frequency? How does this value relate to the population size? If an allele is selected against, can you set up mutation rates that will maintain it at low frequency in the population? 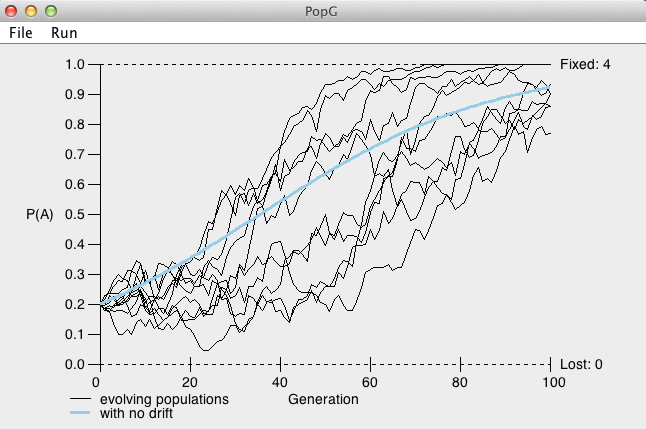 You should be able to use the program to get a good feel for the relative strengths of different evolutionary forces. It is worthwhile trying many different kinds of cases and asking what values of parameters are needed to make one evolutionary force be influential in the presence of another. Version 4.0 of PopG, the first Java version, was written by Ben Zawadzki. His enormously effective programming made good use of mentorship and advice from our lab's Java wizard, Jim McGill. The original version of PopG was written in the 1970s in FORTRAN by Joe Felsenstein. The interactive version then was written in C with much work by Hisashi Horino, Sean Lamont, Bill Alford, Mark Wells, Mike Palczewski, Doug Buxton, Elizabeth Walkup, Ben Zawadzki and Jim McGill. Hisashi and Sean wrote the C version, and the screen graphics for IBM PC and the first part of the Postscript printing system. Bill greatly improved and expanded the Postscript printing and the X windows graphics. Mark Wells did the original Macintosh version. Mike Palczewski greatly improved the Windows, Macintosh and X Windows graphical user interface, and Doug Buxton modified the program to the 3.0 version and prepared the executables for different operating systems. Elizabeth Walkup improved the X windows interaction and prepared version 3.3. Small documentation changes after version 4.0 were made by me. Copyright 1993-2016. University of Washington and Joseph Felsenstein. All rights reserved. Permission is granted to reproduce, perform, and modify this program. Permission is granted to distribute or provide access to this program provided that this copyright notice is not removed, this program is not integrated with or called by any product or service that generates revenue, and that your distribution of this program is free. Any modified versions of this program that are distributed or accessible shall indicate that they are based on this program. Educational institutions are granted permission to distribute this program to their students and staff for a fee to recover distribution costs. Permission requests for any other distribution of this program should be directed to license (at) u.washington.edu.